Articles by Sol Yurick originally published in Social Text, an academic journal published by Duke University Press. Coming off the social upheavals of the 1960s, Social Text was founded as an independent editorial collective in 1979. The journal was subtitled: Theory, Culture, Ideology. 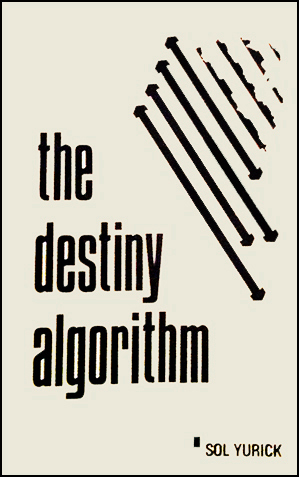 The Destiny Algorithm was also published as a pamphlet. Articles below by Sol Yurick were originally published in Social Text, an academic journal published by Duke University Press. Coming off the social upheavals of the 1960s, Social Text was founded as an independent editorial collective in 1979. The journal, subtitled: Theory, Culture, Ideology, aimed at breaking down barriers between academic disciplines and re-unifying the study of culture and politics using a Marxist framework of theoretical analysis. It has covered a wide range of social and cultural phenomenon beginning with the early debates on mass culture, postmodernism, and postcolonialism, to the collective's current inquiries into issues of academic labor, war and imperialism, queer theory and postcolonial theory. Sol Yurick was a contributing member of the the collective from 1984 to 1990. Texts accessible here with permission of the present publisher, Duke University Press.